We may live in a time when it’s finally okay to acknowledge what most have long known — namely, that book reviewers sometimes know the authors of the books they review. To be sure, book review editors still put up a front of seeking out reviewers who have no acquaintance with an author under consideration, but, as social media has made the world smaller, and as the literary world itself has undergone an unhappy shrinkage, it’s gotten harder and harder to verify that an assigned review won’t wind up being a better reflection of a reviewer’s affection (or animosity) for an author, rather than a true measure of a book’s particular quality. It’s gotten to be a bit like blurbs, hasn’t it? I mean, really — is there anyone out there who still visits bookstores and believes that the downright epileptic spasms of praise on the backs of books indicate true, unsolicited, un-commissioned opinions? This is nothing knew. Henry James wrote extensively and glowingly about Robert Louis Stevenson even as there was a chair in Stevenson’s house known as the “Henry James chair” for the Master’s use of it during salons and soirees; and H.L. Mencken went after Theodore Dreiser — really lit him up — after having met him a number of times. Neither James’s nor Mencken’s opinions are likely the direct product of these relationships, but how can we know that for sure? The relationships are not acknowledged in the critical essays that we must trust to be assessments that are uncorrupted by non-critical views. And now, 100 years later, in a literary world notably smaller and vastly more interconnected, it still works the same way: friends (and enemies) write about each other’s books, but pretend they are writing about strangers. All of which is prelude to me saying fie on that. 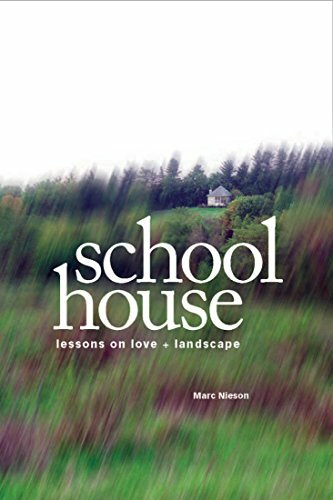 I am reviewing Marc Nieson’s new book, Schoolhouse: Lessons on Love & Landscape, and I have a more than passing familiarity with both the author and the subject. In fact, I’ve known the latter even longer than the former. Schoolhouse is a memoir, which basically means it’s about Nieson’s life and the wisdom he’s drawn from it, but first and foremost it uses Nieson’s time living in an old stone schoolhouse during his stint at the Iowa Writers’ Workshop as a temporal fulcrum and emblem of transition. My part in this is that I visited the schoolhouse even before Nieson did. He’s older than me, but I attended the Workshop before he did, and the guy who lived in the schoolhouse before Nieson happened to be another Workshop student who was also an auto mechanic who knew how to work on Alfa Romeos. As it happened, I had bought a Spider just after I graduated from college, a joke that almost no one got. Anyway, the joke turned out to be on me: the car cost a fortune in repairs, and I spent a number of days visiting the schoolhouse of Schoolhouse. I met Nieson, most likely, at a Workshop poker game, and even in the first few pages of his book one taps into the gentle, anger-averse mien that made Nieson something of an odd presence at both those games, and in that creative writing program, each of which often featured conflict. We became friends in a more than casual, yet less than wholly intimate way, such that there is a lot that is new to me in Schoolhouse, but also much that I recognize from those old Iowa days — in particular, Nieson’s description of the diagram that Frank Conroy used to illustrate the co-creation of art, that melding of minds that is the necessary component of any truly literary event. (I myself have since scarified that image onto the brains of probably 1,000 students by now.) Indeed, you might then leap to the conclusion to that in order to review Nieson’s book I wouldn’t really have to do all that much. We were close; I lived those days too. Probably, I could skim it and do just fine. But that would be completely wrong. There are a few things you can say with certainty about Schoolhouse. It’s a love story that is also a book about a kind of emotional sustainability — how to do right by both your soul and your surrounding — and it’s the tale of a rootless man coming to grow a few. The book globetrots from Iowa to New York to Italy, but thematically it never strays far from the old stone building, since demolished, that stands to this day as a symbol of Nieson’s education, the retelling of which might just teach us a few things too. It’s a kind and quiet book about a world that often isn’t either, and it’s told in a spare language that serves an inverted measure of the volume’s difficult-to-plumb sophistication. But hold on right there. Because that kind of description, i.e., the usual descriptions of book reviews, doesn’t really describe my experience of Schoolhouse at all. If I’m to be honest, then I must allow that my experience of my friend’s book was based almost entirely on the difference between the man I found in these pages and the one that I thought I knew. When you read books by strangers — as Gertrude Stein would have us do (“I write for myself and strangers,” she wrote, though she had plenty of writer buddies) — you don’t get to experience that at all. Of course you recognize that you have a particular kind of intimacy with people in books, and with people through books, which everyday relationships lack, but if you never read a book that was written by someone you know, then you never come truly face to face with the sad inadequacy of real life, which is the reason books exist in the first place. When I read Schoolhouse, I realized there was more pain and past in Nieson’s life than I had ever known or suspected might have lurked there. My impulse was to dig into my own past and project this new Nieson onto my fragmented memories of him, as though I could I heal the gaps in my past that suddenly felt like wounds. Amputations and oversights…That pretty well describes the emotion I was left with at the end of this simple, powerful book, written by a guy I once knew fairly well. Or so I thought. A good book, by its goodness, proves the inadequacy of the world to which it is addressed. And I now know Marc Nieson all over again, as you might — as a vague, perfect, intimate stranger. It’s interesting that so few narratives about Harvard have ever been told from the non-elite, unassimilated experience. Such a void is, finally and wonderfully, filled by Andre Aciman’s brilliant new novel. Fret not friendo, no book is safe in the kangaroo court of personal taste. Your worries about the sincerity of a review regarding a person you know is frank, but silly. It’s like worrying about author intentionality. You silly sad fool! If you worried a bit more about author intentionality, you wouldn’t embarrass yourself like this. Cut off the tap, my friend! You’ll be happier wallowing in silence.